Folks on the other side of the pond can consider themselves quite lucky. 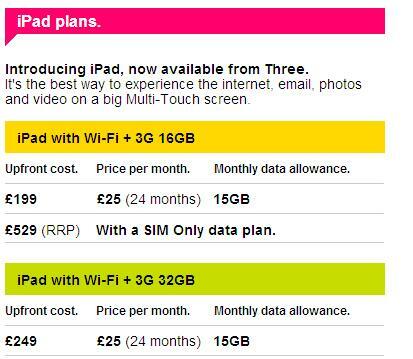 Unlike at&t’s less-than-generous data plans for iPad ($25 for 2GB), users who subscribe to 3UK’s data plans for the iPad can get anywhere from 10GB to 15GB for UK£15 and UK£25 respectively. Stated otherwise, 10GB costs you roughly $25 per month (1UK£ equals roughly 1.5 US$) – five times the data for the same price! No wonder that the 3G version of the Apple iPad was the most popular among UK shoppers during the Christmas shopping season, according to the latest stats from market research firm Context. The firm found that 80 per cent of UK iPad sales recorded in November were for the 3G version, due to mobile network operator stores being a major outlet for sales of the device. But at&t should watch out – rumors are swirling that Apple is planning to announce not 2, but 3 versions of the second-generation iPad including a CDMA version for Verizon Wireless, come April 2011. It will be quite interesting to watch how Verizon Wireless prices the data plans for the iPad 2! Can also get deals from £15 a month but the upfront cost is a hell of a lot more. It is nice to think we are at last getting some good deals on this side of the pond. The only trouble is that 3s coverage is certainly no where near the best in the UK! !